What if Minecraft was more like EVE Online? 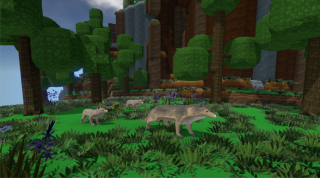 Eco is a sandbox survival game where players' actions damage a shared ecosystem. Mining, hunting, and lumberjacking all impact species of plants and animals on the world, life that doesn't infinitely replenish. It's Minecraft with a conscience, but it also has the potential to be a fascinating social game with the capacity for political machinations and the sort of social engineering we usually associate with EVE Online, as Strange Loop Games' John Krajewski told me during PAX. There are and will continue to be a ton of Minecraft-alikes out there, but Eco stands out both as a thought-provoking social exercise and as a game that will probably produce interesting stories of cooperation or conflict that we'll be hearing about for the next several years.